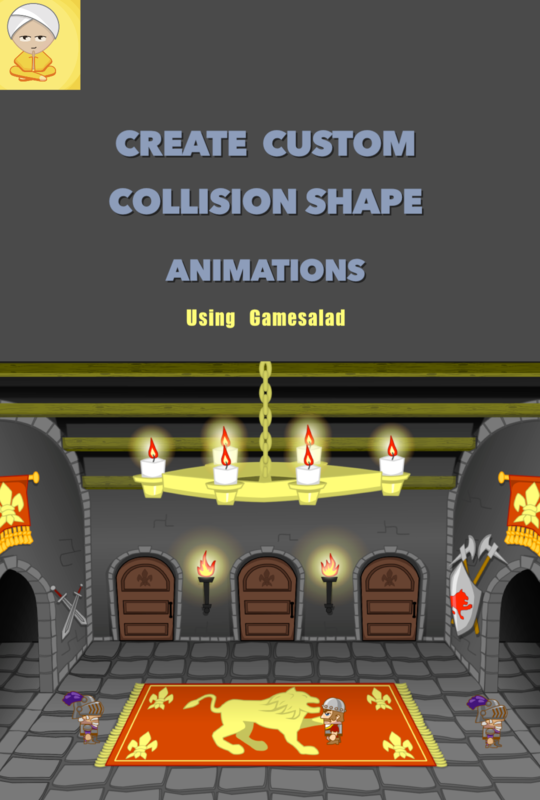 Now available Custom Collision Shape Animations (OnDemand videos series) — Welcome to the GameSalad forum! Five part video series in 4K. These videos are also downloadable so you can own them forever. In this series, I teach you my unique design for creating custom collision shape animations. Using custom collision shape animations you can now power up your game to be able to have your characters conform to their environment, as well as, the ability to log and track the power and damage attacks a character might execute. Also as a bonus, you get to see how to build streamlined and integrated code first hand! I like the idea of monetising a video training series. You've given us so much for free, for so long, that it's about time you were rewarded appropriately. I setup the ondemand site for my multiplayer series I have 20 videos on there waiting for when they put it back in. I will still be doing free videos for regular tutorials but some take lots of time to do. This five part series took three days to produce,edit, process and upload. That doesn't include the time to think up and build this process in GS. Plus PhilipCC for being the first to comment in this thread, I'm giving you a promo code for free access! Just please write a review on the site and in this thread. Check your inbox. Im all for moving training videos like this to a paid service. As @Lost_Oasis_Games has outlined above, the time involved in these is incredible as well as years of support after the release. I still get emails for videos that are years old and I only made a handful. I couldn't imagine what Daves inbox is like for his dedication to the forum! Keep up the good work Dave and Im looking forward to supporting your MP series when you release it. Hey @Lost_Oasis_Games , I just sent you an email for your developer rates. I'm new to the mobile game area but I actually sell online courses for a living. Have you tried creating GameSalad courses and selling them on Udemy? Pretty good passive income over there - I have over 20,000 students myself with my courses. I don't want to link my account here and look like a spammer, but you can search Kory Pearman and check out my stuff. I'd be glad to help you if you need some assistance with the whole Udemy/course selling thing! Even more cool. I only came back to this thread today to discover your comment from last Sunday the 8th. "An exceptional series of tutorials for any GameSalad developer (beginner or Pro). Clear, concise, methodical lessons that you can easily follow along with while you duplicate them in GameSalad at the same time. Bravo Dave, I'm delighted... and now more knowledgeable for this series." Ah, been busy this week. But this thread could use a bump as nobody seems interested in custom collision shape animations. I figured this would be a coveted concept. Low interest maybe due to the fact that this is a paid product. Not much people can say if they can't watch the video. While I may be interested, I don't think it's worth me spending money on it because it's probably just a cool method I would never get around to using. Then if I did watch it, I can't really share any ideas or tips or questions here. Best of luck with your in demand videos. Good for you Dave! Glad to see you put out some tuts on topics like this. Those that need it, will find use in it! Cheers! anyone who is making any sort of RPG or fighting game would really do well with this. It really is pixel level collisions throughout the entire animation. Just a note: Jon has seen the project file and played with it so this is a first hand account. True. I can't be expected to give everything away though. I worked hard on devising this method. I spent days making these videos, which are professional and high quality. And I charge $2.00 a video as there are 5 in the series. I'm going to build a fighting vertical platformer with this method. Hi @Lost_Oasis_Games This is exactly what i need for my project! Also watched a few of your other tuts, very useful and insightful. Do I need physics body editor or the other one? @The_Gamesalad_Guru Bump, because I also like to see the little guy in the yellow pyjamas on the 1st page.